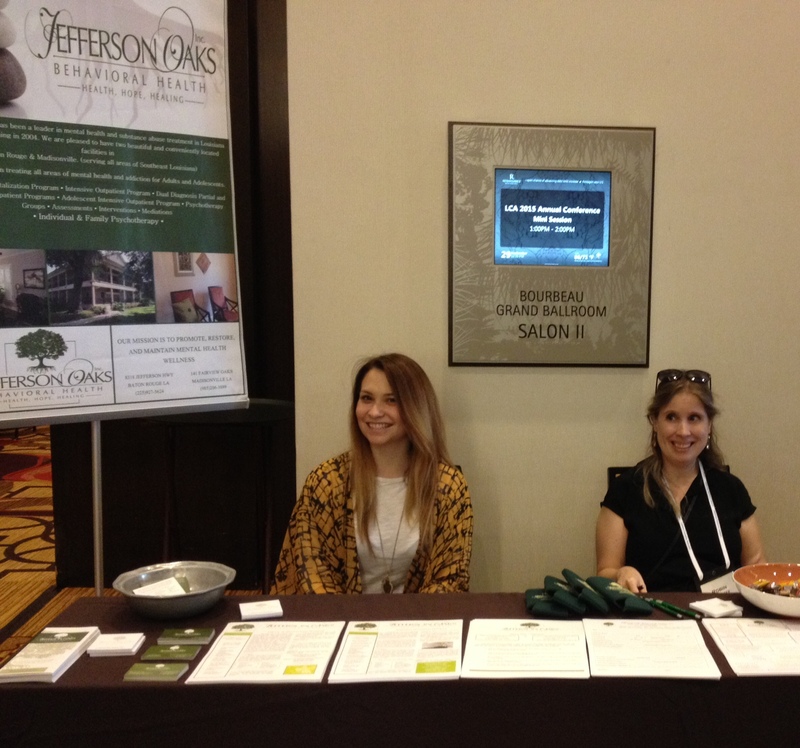 Jefferson Oaks behavioral health staff recently attended the Louisiana Psychiatric Medical Association annual conference where we were afforded an opportunity to have an informative exchange with over 100 Psychiatrists on critical mental health problems and issues. Members of our Baton Rouge and Madisonville therapy centers attended psychiatric presentations on important research and mental health topics delivered by psychiatric experts. 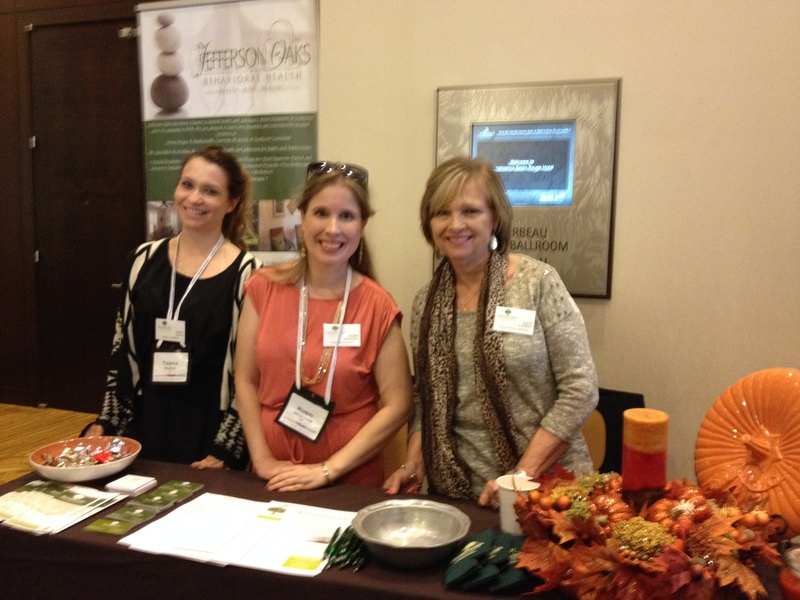 Jefferson Oaks Behavioral Hospital was pleased to exhibit, meet and discuss mental health and behavioral health services provided by our Baton Rouge and Madisonville rehab centers at this Louisiana Psychiatric Medical Association. 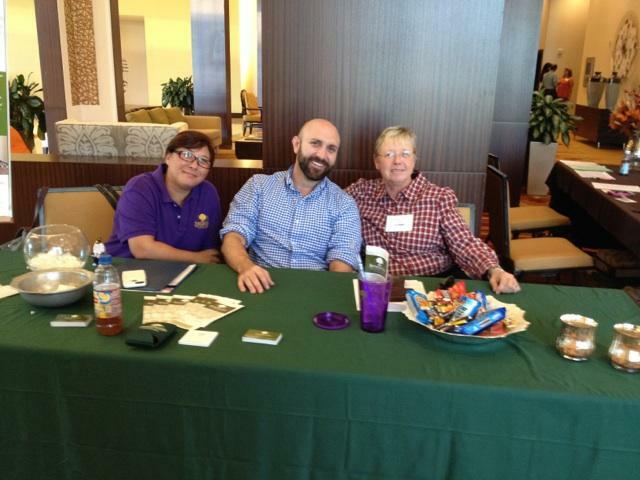 Below are some photos of our Louisiana mental health and wellness staff at the conference. The mission of Louisiana Psychiatric Medical Association (LPMA) is to promote mental health and improve the quality of treatments available for psychiatric disorders. 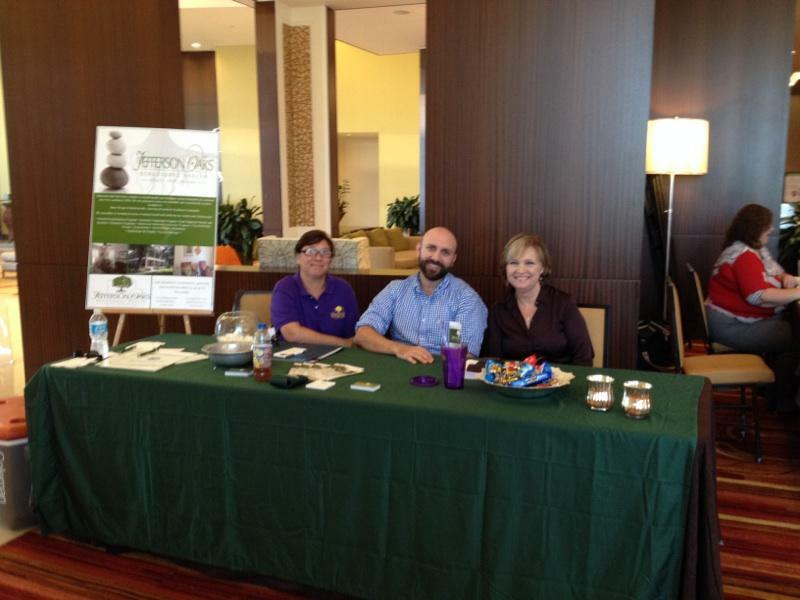 The team at Jefferson Oaks Baton Rouge outpatient center recently attended a Louisiana mental health and wellness conference at the Renaissance Hotel in Baton Rouge. This conference was the annual Louisiana Counseling Association Conference; The focus of this year's conference was interrelationships and the ties that bind us together. As someone who works in a Baton Rouge behavioral health hospital, this conference allowed me to network with other mental health professionals and seek development both in my career and individually. I discuss my conference experience and related thoughts below. In the mental health profession, part of ethical and moral responsibility is to participate in continuing education events to share knowledge, expertise, and to network with other professionals. Recently, I was able to attend the annual Louisiana Counseling Association Conference to enhance my professional and personal growth. This year was the highest attended conference on record which provided a wonderful opportunity to network with other counselors and mental health professionals. Typically, in the past when I have attended I was there for just educational purposes and have not concentrated on networking with others, but this year I was also there as a representative for Jefferson Oaks Behavioral Health’s outpatient services. This allowed me to meet with hundreds of other professionals in a new capacity. This provided me the opportunity to share my belief and confidence in our outpatient service programs on a large scale and gain resources for continuing care referrals to best suit our clients and their individualized needs. In addition to networking opportunities, I was able to attend workshops that increased my professional and personal development. The focuses of these workshops were so various it allowed me to increase my skills in working with groups, couples, families, and individuals. Two of the workshops I attended in particular were so powerful it reignited my passion for being a therapist all over again. One focused on couples’ communication and acknowledging the masculine and feminine “gifts” that we give one another; the other was on the power of empathy in the therapeutic relationship as told by a current client. I always believed the main reason that I attended this conference year after year was to gain knowledge and tools to bring back to my clients. This year, however, I attended the conference because I leave feeling refreshed and rejuvenated personally as well as professionally, excited to bring these new tools to my clients in outpatient services. As a clinician who helps clients with behavioral health issues in Madisonville, LA, I often hear clients discuss how easy it can be to feel overwhelmed by their day to day responsibilities and stressors. So often we are focused on what we have to accomplish while simultaneously focusing on what we failed to accomplish yesterday. These and a myriad of other thoughts take us away from the present moment. In fact, it can feel as if we no longer have time to really take notice of ourselves and be aware of how we are truly feeling. In my experience as a therapist at Jefferson Oaks Behavioral Health of Madisonville, I have seen the impact that mindfulness and meditation can have in reducing stress, anxiety and depression. When thinking of meditation we often conjure up an image of sitting in lotus position on the floor for long periods of time. The reality of this practice is that it can be done very simply wherever you happen to be and it does not need to interfere with your daily schedule. While there is no one correct way to practice mindfulness, the overall goal of any mindfulness practice is to bring your mind into a state of nonjudgmental awareness. Learning to incorporate this practice into your day can greatly reduce our stress and anxiety. While some anxiety is a normal and even a healthy motivating factor in our everyday lives, the problem lies in unproductive thoughts and worries that prevent us from problem-solving and moving past our anxiety. Mindfulness practice can help us to recognize these thoughts and to be aware that it is only that anxious inner voice again. In my practice as a Madisonville behavioral health specialist, I strive to incorporate mindfulness practices that are easy to use throughout each day. So what are some of the ways that you can practice mindfulness? One of the basic ways is to sit quietly and focus your mind on your breathing. As you do so, you begin to take notice of your bodily sensations. If you feel an itch, do not judge it. Let your body experience exactly what it is feeling in that moment. Next, you will become aware of any thoughts or emotions that enter into your mind. You may notice that your mind begins to drift back to the things you need to accomplish for the day. Allow your thoughts to simply be what they are without judging them. The key here is that there is no wrong feeling, sensation or thought. These practices do not have to be done while sitting in a quiet place. You can practice being aware as you go through any of your daily activities. Mindfulness can easily be incorporated into our daily routine in order to achieve a calmer and more accepting state of mind. With these small steps, we can work towards improving the overall mental health and wellness in Madisonville and beyond.